If you find yourself in Taipei, Taiwan, then soy milk needs to be on your list of foods to try! We’re not just talking about soy milk, the drink. We’re talking about a traditional Taiwanese breakfast that is ever so delicious. 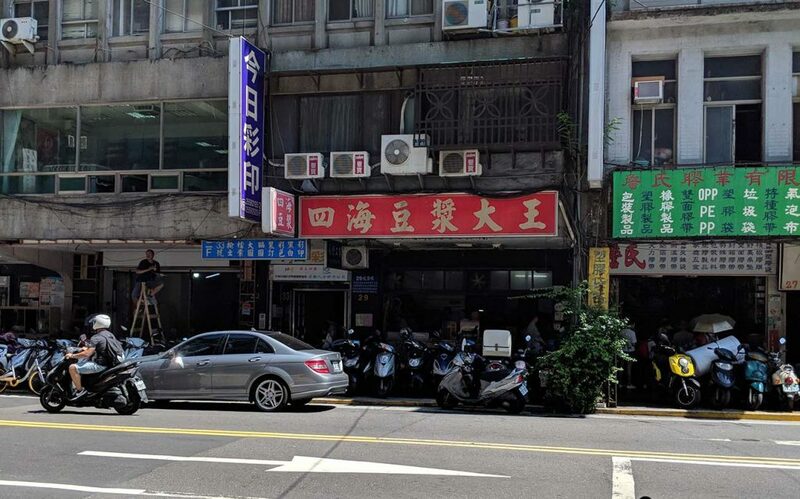 We think you’ll find that it’s some of the best food in Taipei! 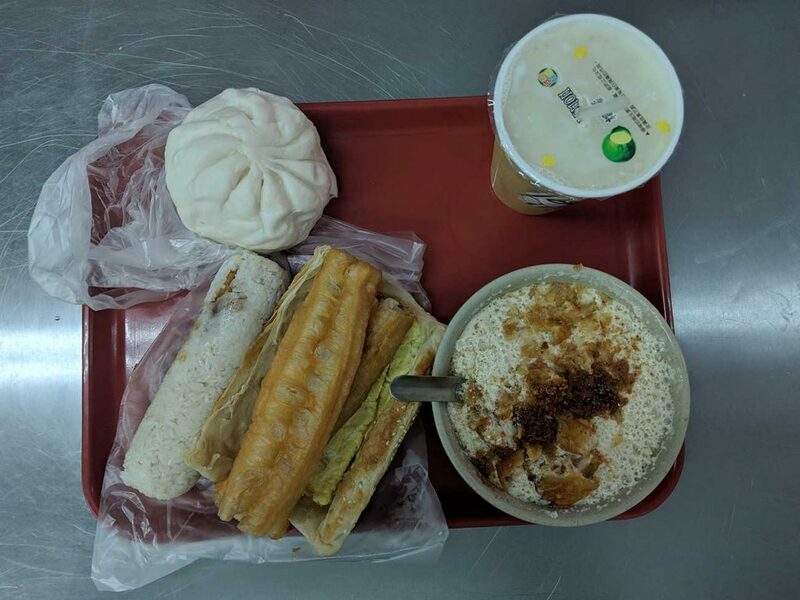 From hot or cold soy milk, salty or sweet, to meat-filled steamed buns and soup dumplings, to flaky sesame bread packed with egg and pork, you can’t go wrong at a soy milk joint. Cure that breakfast hunger or the afternoon munchies with some savory Taiwanese style grub for cheap! Foodies rejoice! We’ve listed our favorite soy milk restaurants in Taipei. We found Sihai during our first trip to Taipei. It was a short 5 minute walk from the apartment we were staying in. This restaurant was an incredible find! 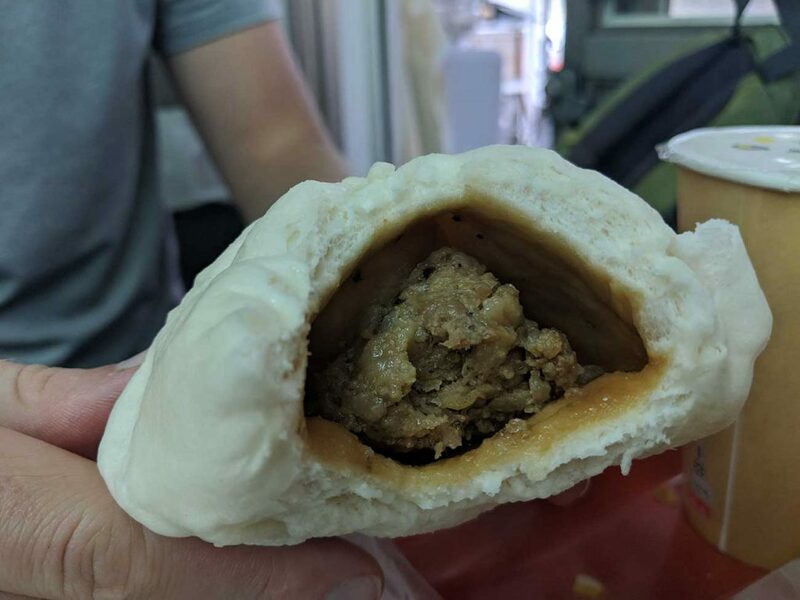 Our first time there we ordered shao bing (a flakey sesame flatbread) with a fried omelet and pork patty inside it as well as xiao long bao. Because you can’t go wrong with xiao long bao! Especailly when it’s only around $2 USD! If you order takeaway and don’t know the language (like we did the first few times) then we recommend you Google the restaurant beforehand and have some pictures ready. If you eat in then they provide you with an English menu…with pictures! We stumbled upon Yong He when we were exploring the Da’an Forest Park, luckily finding it on our map and deciding to try it out! We were not disappointed. They definitely offer up some of the best food in Taipei. Here, we tried shao bing you tiao, which is the flakey sesame bread with a fried dough stick in the middle. We also ordered xiao long bao (of course!) and a hot salty soybean soup topped with crumbled you tiao, crispy pork floss and some green onions! 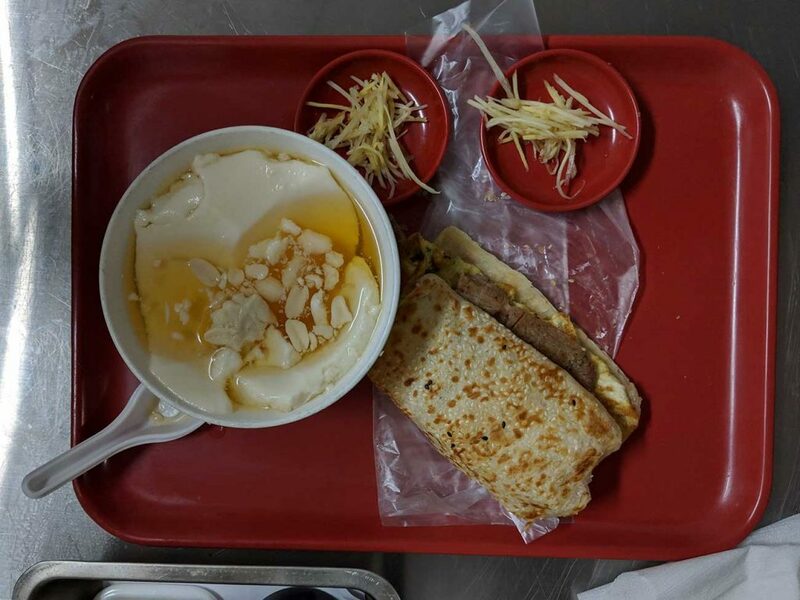 On our second trip we tried shao bing you tiao and the soybean soup again, as well as a rice roll stuffed with crispy pork floss and a steamed bun filled with pork. We washed it down with some cold sugar free soy milk. All of this was only around $5 USD. Say what?! The ladies at this restaurant were so friendly and the food was delicious! 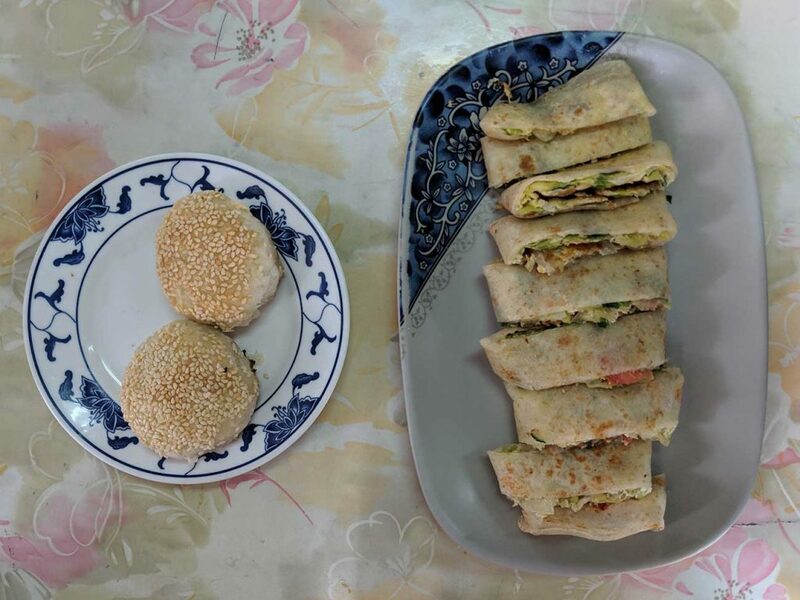 We’re not exactly sure what we tried but we sampled a sesame pastry filled with green vegetables and a flatbread similar to a tortilla filled with an omelet. So salty and so good. The seating here, on the sidewalk, is very limited so this restaurant favors the take away but we were fortunate enough to have a seat available. There’s a thick sweet soy sauce that they recommended we drizzle over our omelet. We recommend too! It was the perfect addition. Our honorable mention is Fuhang Soy Milk. This restaurant most definitely has buzz surrounding it, which is proven by the really long line! This restaurant was one we heard about before arriving in Taipei. It’s been called the best soy milk in Taipei by some, but honestly, the other soy milk restaurants are better if you ask us. Plus, there’s no wait involved! 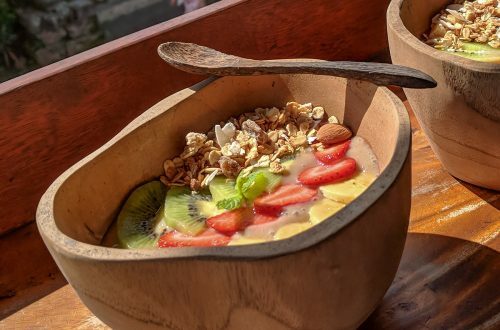 There are so many soy milk restaurants serving up deliciousness, which means you have no excuse to not try some of the best food in Taipei! Add in the fact that you can leave stuffed to the brim for a few bucks, seriously, you have no excuse. Regardless of what soy milk restaurant you choose you’re going to leave satisfied. And thirsty! So much salty food makes water a necessity. Or there’s always milk tea! Try the creamy milk tea or salty green milk tea from 85 degrees. 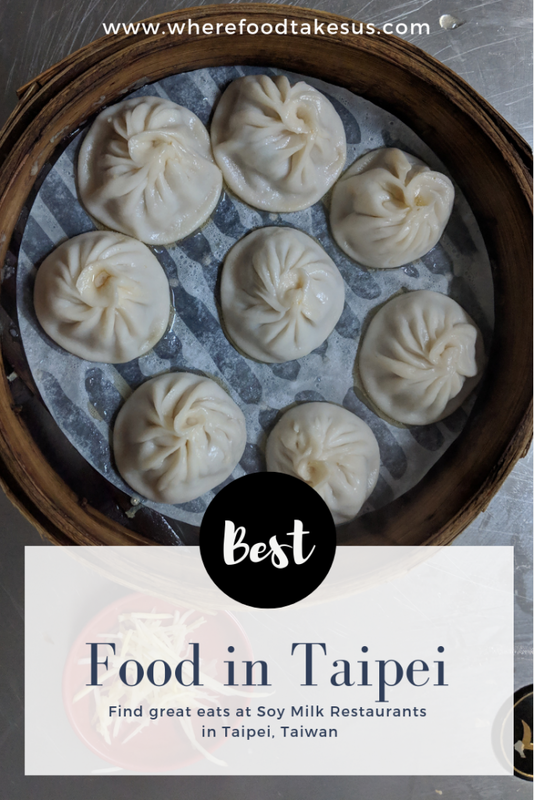 Now that your hunger is satisfied with some of the best food in this city, check out our post for some cool things to do in Taipei! Yes, we were very lost at the beginning. We didn’t know any Chinese at first, but thankfully it turned out to be some great guessing on our part haha. So tasty! I love how different places have such unique breakfasts. Would love to try breakfast (and all meals!) in Taipei. Those dumplings look absolutely delicious! It’s great, isn’t it? 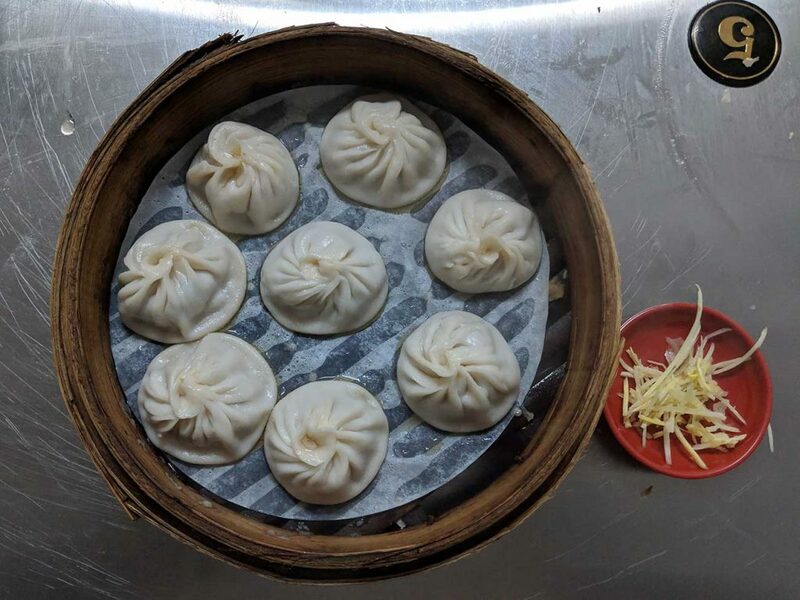 We were in Taiwan for months and dumplings never got old. They were great every time. Thanks for reading! Yes, if eggs and cheese are up your alley then you’re in for a treat! If you’re ever in Taipei give soy milk a shot! Thanks for your comment. I had no idea that soy milk could be used for so many things. Soy bean soup sounds delicious. And the looks of those dumplings has me salivating right now. 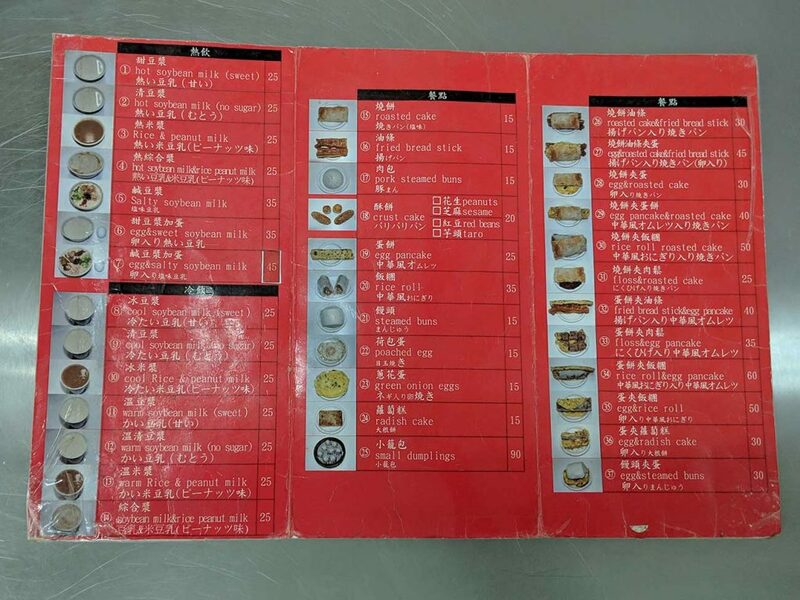 I appreciate that the menus display pictures of the food items for those who don’t know the language. Honestly we ordered the soy soup on accident but it turned out to be a favorite of ours. The menu pictures were a lifesaver! Taipei’s food scene looks something unique and tempting. As I have never tasted these things, I would definitely head to Soy Milk restaurant whenever I visit Taipei. Thanks for sharing. 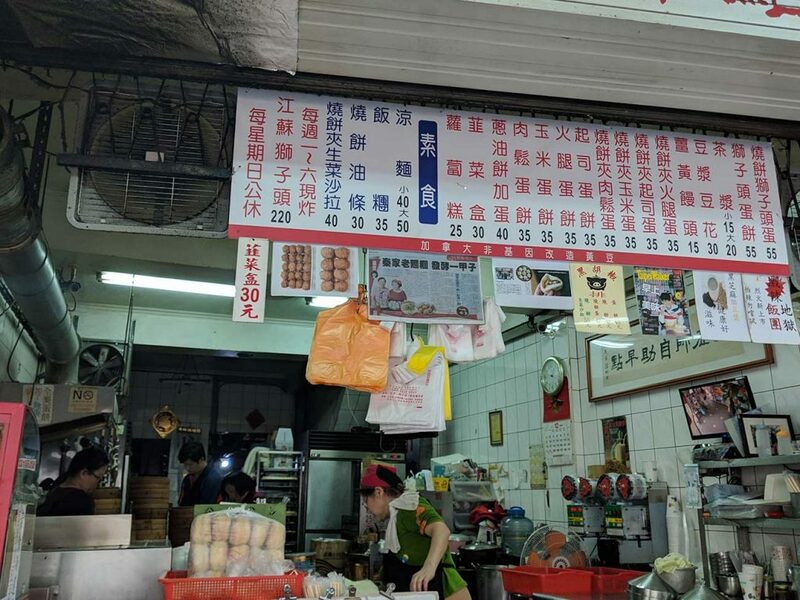 You have listed best food in Taipei from Soy Milk Restaurant. Flakey seasame bread looks worth to try out. Thanks for sharing something unique food options in Taipei. Many of the soy milk restaurants had English menus with pictures. The only one we went to that didn’t have an English menu was Chin Sir but one of the ladies there spoke some English to help us out. Usually for restaurants with no English menu we’d find the characters for different meats we know and pick at random. It’s a mini surprise that way! Who doesn’t love food right? What a great way to highlight some of Taipei’s best food! Great photos and descriptions. Thanks for sharing. We absolutely love food! It’s our driving force for travel. I’ll take the Chin Sir Soybean Milk for the win! You had me at pastry salt and drizzled with sweet soy sauce. Actually it all looked great because I love dim sum and this is what a few of the pics looked like. I haven’t been to Taiwan (yet) but I clearly need to go and now I know what I’m going to try! It really is an incredible country and at the moment it isn’t super touristy, which is really nice. You definitely have to try out the soy milk restaurants and Taiwan has some pretty amazing night markets. It really is delicious! We hope you get to try one of these great restaurants one day. I have never been to Taipei yet and I am sure if I can find vegetarian food over there. But soy milk sounds interesting and would love to it. 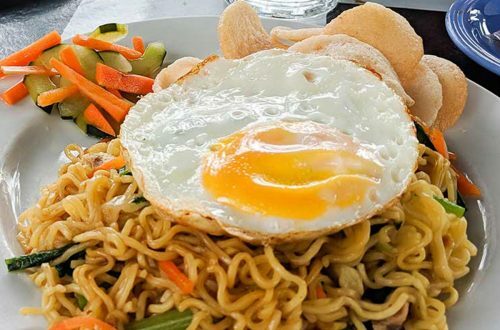 If you’re the kind of vegetarian that eats eggs then you’ll definitely find something to eat since they have a lot of dishes with just shao bing and egg or a steamed bun stuffed with egg. You’ll definitely find a lot of vegetarian options in Taiwan, especially at night markets! Dumplings, and sticky rice, and shao bing, OH MY! But seriously all of the different food you found in Taipei sounds and looks so good! I love all of the pork patties too. I can just smell it all plus you had me at $5 for the cost! Talk about a cot effective feast! The $5 cost is the best part! So much deliciousness for so cheap. Taipei is a great city! Thanks for commenting.